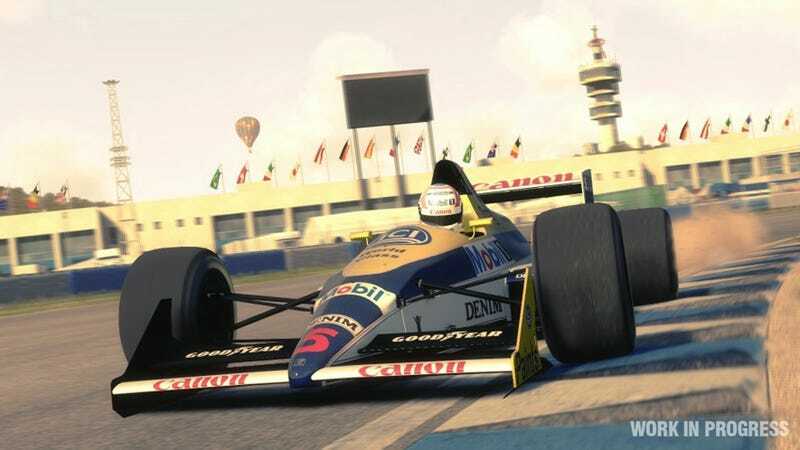 Today's addition to the 'shut up and take my money' category of driving sims is F1 2013, which will include F1 cars of the 1980s and 1990s. In other words, the best F1 cars. You get classic versions of some racetracks as well, from before they got chicanes and runoff strips in the names of lower speeds and higher safety. Codemasters still hasn't announced three of the ten drivers, two more cars from the '80s, and three more cars from the '90s. The content will be available as downloadable packs released after the 2013 game this fall, one DLC for the 1980s and one DLC for the '90s. There will also be a "Classic Edition" game package, with both DLCs and the 2013 game all wrapped into one. F1 Fanatic drove the cars and said they were pretty good and the 2013 mode largely unchanged from the 2012 game. They point out that only bummer is that you can't mix and match cars from different eras, so no racing an '80s turbo car against a '90s active suspension car against a current 2013 machine. Shame.